P.H. VAN BRACHT. The sea slugs, Sacoglossa and Nudibranchia (Gastropoda, Opisthobranchia), of the Netherlands. Swennen & Dekker (1987) published a comprehensive list of 38 species of Saccoglossa and Nudibranchia known from The Netherlands. Since then 11 additional species, two of which are unidentified members of the Doto complex were found in the area. Here, a revised list of all Dutch sea slugs is given, with their scientific names and common Dutch names. Characteristic anatomical features of the animals are mentioned, with their geographical and seasonal distribution and notes on their spawn and feeding behavior. The question why so many new species could be added to the Dutch marine fauna list is also discussed. The species of the class Cephalopoda occurring in Dutch waters are mentioned. For four species, viz. Sepia officinalis, Sepiola atlantica, Loligo vulgaris and Alloteuthis subulata, the species most likely to be encountered while scuba-diving, distinghuishing characters for recognition in the field are given. J. GOUD. The recent introduction of the poorly ribbed cockle, Acanthocardia paucicostata (Bivalvia, Cardiidae), in the Grevelingen. In recent years live Acanthocardia paucicostata was reported from the Grevelingen in the Dutch delta area. It is discussed how this species might have reached the SW Netherlands and where it probably came from. Data on its ecology as an invasive species are alos given. A detailed description of the shells of A. paucicostata is provided. Additionally, some complex nomenclatural problems related to this species are dealt with in an attempt to stabilize the use of its well-known scientific name. J. GOUD. The prickly cockle, Acanthocardia echinata (Bivalvia, Cardiidae), recently found in the Oosterschelde. Recently live Acanthocardia echinata was reported from the Oosterschelde in the Dutch delta area, where the species might have established itself. E. GITTENBERGER. The queen scallop, Aequipecten opercularis (Bivalvia, Pectinidae), in the Netherlands. Live Aequipecten opercularis have been collected at several localities in the Dutch delta area, where the species seems to have established itself. J. VERKUIL. The American razorshell (Bivalvia, Pharidae), in the Oosterschelde and Grevelingen. The occurrence of Ensis americanus in the Oosterschelde and the Grevelingen is reported. This species invaded this inshore part of The Netherlands while it was already very common along the Dutch coast. E. GITTENBERGER, D. GROENENBERG & F. WESSELINGH. Mysterious mussels Mytilus spec. (Bivalvia, Mytilidae), in The Netherlands. Shell morphology suggests that there are two species of hybridizing subspecies of Mytilus in The Netherlands now. They were simply referred to as M. edulis and M. galloprovincialis, which is not satisfying. Ongoing DNA sequencing revealed as a preliminary result a far more complex pattern of evolutionary relationships. Ecophenotypic variation or convergent evolution in shell shape, secondary contacts between poorly defined ancestral taxa caused by dispersal or by human introductions, hybridization and introgression may all have contributed to the actual rather chaotic situation in Mytilus in The Netherlands. F.F.L.M. TITSELAAR. Limpets (Gastropoda, Patellidae) in the province of Zealand. The occurrence of Patella vulgaris in the province of Zeeland is dealt with. The species has been going through a comeback in recent years in the area. M. BOS. Population dynamics on the basket shell Corbula gibba (Bivalvia, Corbulidae), in the Dutch delta. An increase of the basket shell, Corbula gibba (Olivi, 1792), was registered locally in subtidal zones of the Oosterschelde and Grevelingen. In Lake Veere considerable fluctuations were recorded in the nineties, but the species became extinct or nearly so during the last four years. In the Westerschelde only one specimen was recorded. 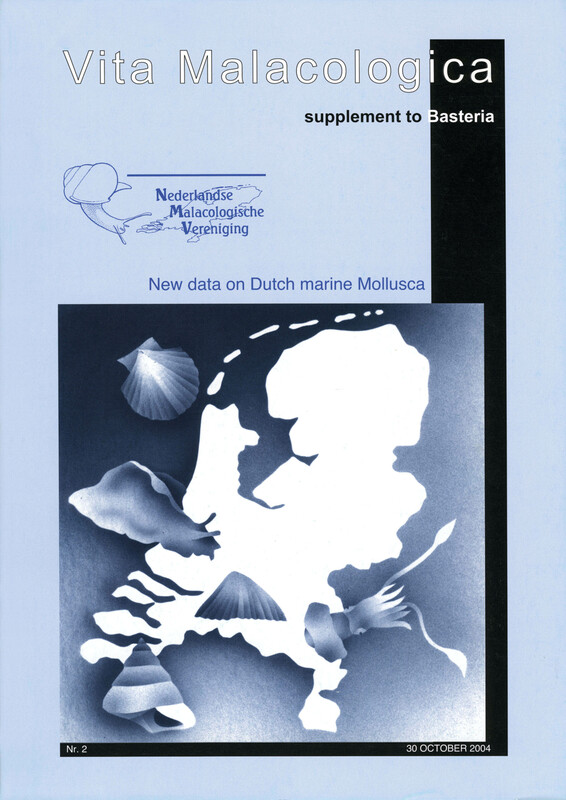 Despite intensive monitoring between 1959 and 1986, the first records from the Dutch delta-system are only from 1990, for various parts of the Grevelingen and the northern branch of the Oosterschelde. The data suggest that the introduction of C. gibba took place between 1986 and 1990, supposedly in the western part of the Grevelingen. The species reached the eastern part of the Grevelingen and the northernmost part of the Oosterschelde later on. Extreme fluctuations in population densities in C. gibba seem to be correlated with eutrophication, oxygen levels and disturbance of the ecosystem in general. J. GOUD & E. GITTENBERGER. Live Lamellaria (Gastropoda, Lamelariidae), in The Netherlands. There are two records with a single specimen each, of a Lamellaria species from the Oosterschelde. This species could not yet be identified. The two Lamellaria species known from the British fauna are clearly different. H. HOLSTEIJN. A cowrie, Trivia arctica (Gastropoda, Triviidae), in in the Dutch delta. At least one Trivia species, viz. T. arctica, has been reported several times now from the Dutch Delta and might have established itself in that area. B. KOKSHOORN. Wentletraps (Gastropoda, Epitoniidae), in The Netherlands. Dutch records of live animals of two Epitonium species are given, with more general notes on shell morphology and distribution of these species. Two epitonid species that are known from The Netherlands by shells only are shortly dealt with as well. E. GITTENBERGER. The painted top shell, Calliostoma zizyphinum (Gastropoda, Trochidae), rare but it’s there. Recently live Calliostoma zizyphinum was collected in the Oosterschelde in the Dutch delta area, where the species is still rare however. E. GITTENBERGER. The grey top shell, Gibbula cinerea (Gastropoda, Trochidae), finally established in the Dutch delta. Live Gibbula cinerea has been collected at several localities in the Oosterschelde in the Dutch delta area, where the species seems to have established itself. E. NIJLAND. The dog whelk, Nucella lapillus (Gastropoda, Muricidae), in The Netherlands, in particular its occurrence in the Oosterschelde and the Grevelingen. The data on the occurrence of Nucella lapillus in The Netherlands, in particular in the Oosterschelde and the Grevelingen, are summarized. Our knowledge on the present distribution of this once common Dutch species is very incomplete. H. DEKKER. The netted dog whelk and its sibling, Nassarius reticulatus and N. nitidus (Gastropoda, Nassariidae), in The Netherlands. Shells of both Nassarius reticulatus and N. nitidus are found in The Netherlands as empty shells along the coast. The first species is only rarely washed ashore living, the second one is very commonly found living in SW Netherlands. Diagnostic shell characters are listed. M. FAASSE. Onoba semicostata (Gastropoda, Rissoidae), in coastal waters in The Netherlands. Recently Onoba semicostata (Montagu, 1803) was collected at several localities in the Oosterschelde. These are the first inshore records of this species.